A Sokoban game for KDE 4. KSokoban-NG is a rewrite of the KDE 3 game KSokoban for KDE 4. The look and feel of the old game has been preserved in many ways. The goal of the game is to move all gems (red) onto target squares (green). Gems can be moved only by pushing them. KSokoban-NG needs Python 3 and the Python 3 bindings for KDE 4. This should be available on most modern Linux distributions. It is not necessary to be using a KDE desktop to run KSokoban-NG. To install the Python 3 bindings for KDE 4 on Ubuntu, install the python3-pykde4 package. Extract the downloaded file. Enter the ksokoban-ng folder and run KDEDIRS="$PWD" ./ksokoban-ng.py. This is clearly not the best way to distribute KSokoban-NG, but until I figure out how to package it, this will have to do. The original game was written by Anders Widell, and KSokoban-NG uses the same graphics. 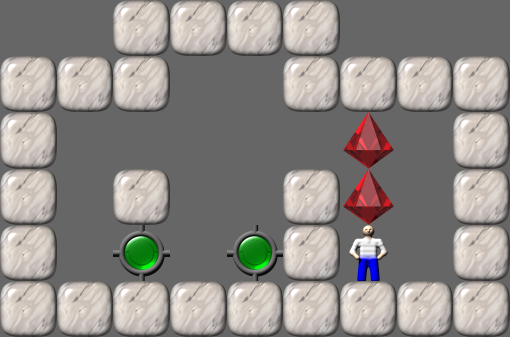 The levels, as in the original game, are by David W. Skinner. KSokoban-NG is licensed under the GNU General Public License v2.